We’d love your help. Let us know what’s wrong with this preview of Nim's Island by Wendy Orr. To ask other readers questions about Nim's Island, please sign up. Jim Harrison I thought it was great. The location was perfect. Summary: Nim Rusoe lives with her scientist father Jack on a se This is one of several reviews I wrote for the late Secular Homeschooling Magazine. We ran an article about homeschoolers in fiction, and I rated a lot of YA novels based on how good they were and how well they handled homeschooling. Mostly, homeschoolers were hauled out as the reliable weirdos in story after story; but it was still fun to do lots of reading and call it my job. Omg I loved this! This is what I wanted Pippi Longstocking to be but it wasn't. Can't wait to read it in a couple of years with the munchkin. I read this book to my second graders and we all enjoyed it. Even the boys liked it, which was a concern when I first pulled it out and overheard comments from some of them about it being a "girl's book." I guess anything with a girl as the main character qualifies as a girl's book. The fact that she had a machete early on in the book seemed to help tremendously. In my children's lit class a few years back, we discussed the fact that many beloved children's novels center around characters who ha I read this book to my second graders and we all enjoyed it. Even the boys liked it, which was a concern when I first pulled it out and overheard comments from some of them about it being a "girl's book." I guess anything with a girl as the main character qualifies as a girl's book. The fact that she had a machete early on in the book seemed to help tremendously. I would give this book a hundred stars if I could. I liked it because I am a girl who likes adventure, and it was about adventure. This is officially the last book in my "2017 Lite and Fluffy" reading challenge. I think a very young YA (maybe even juvenile) is the perfect ending. I loved the movie "Nim's Island" it was fun and just the right amount of scary for young children. The book was equally enjoyable and kept my attention. I hope that doesn't say something negative about me. It was just a good story. I read this book to my students. Many of them were excited about the movie. I tried to convince them that the movie we create in our heads when we read is better than the one we see when someone else creates it. They loved it! I read a book called Nim's Island by one of my new favorite authors named Wendy Orr. It's about a girl named Nim. Her mom and dad are scientists, and when Nim was 1 her mom went to study a whale's stomach. Nim's mom was swallowed by the whale and never seen again. Nim's dad decided to sail the ocean to look for the whale that swallowed his wife. They sailed the ocean for 3 years, and then Nim's dad decided that Nim was ready to explore more than just the small sailboat. They stopped on a beautif I read a book called Nim's Island by one of my new favorite authors named Wendy Orr. It's about a girl named Nim. Her mom and dad are scientists, and when Nim was 1 her mom went to study a whale's stomach. Nim's mom was swallowed by the whale and never seen again. Nim's dad decided to sail the ocean to look for the whale that swallowed his wife. They sailed the ocean for 3 years, and then Nim's dad decided that Nim was ready to explore more than just the small sailboat. They stopped on a beautiful island and decided to make it their special home. They didn't want the world to see it though, so they kept the location to themselves. When Nim was 12, her father decided to go out and study plankton for 2 days, and to leave Nim alone on the island. The island was completely safe, and she had animal friends to hang out with. Since Nim's father is a scientist, he emails with other scientists around the world, including Alex Rover, Nim's favorite author/adventurer of all time. Nim receives and email from him asking about the volcano on their island. She responds, and Nim and Alex become email-pals. Soon, Nim realizes that it's been 3 days, and her dad still isn't back. She tries calling him on the cable-phone, but he didn't pick up. He couldn't have just missed the call on that tiny sail boat! While emailing with Alex, Nim finds out that Alex Rover is short for Alexandra Rover, and Alexandra is too scared to even leave her own tiny apartment! She can't be the hero of her own stories! Alexandra also finds out that Nim isn't just some scientist that's Jack's friend, she's Jack's daughter! Nim receives a letter from Jack, saying that there's a storm coming, and she'd better get everything and take it to the emergency cave with her. Nim knew how fast storms came on the ocean, she needed to get there fast! Some children’s books are what I jokingly call “wasted on children” — books so good that adults, too, will adore them: J.K. Rowling’s Harry Potter series, The Book Thief, The Little Prince, The Cavendish Home for Boys and Girls, One Hundred and One Dalmatians, The Dumb Bunnies, Charlotte's Web, The Magic Thief, Just Grace. But that doesn’t apply to Wendy Orr’s Nim’s Island? I’m sure that there are 8- to 10-year-olds who will savor this tale of a modern-day The Swiss Family Robinson, but adults w Some children’s books are what I jokingly call “wasted on children” — books so good that adults, too, will adore them: J.K. Rowling’s Harry Potter series, The Book Thief, The Little Prince, The Cavendish Home for Boys and Girls, One Hundred and One Dalmatians, The Dumb Bunnies, Charlotte's Web, The Magic Thief, Just Grace. I loved the story and Nim as a character, she reminded me of Grace from The Fossil Hunter of Sydney Mines. But I found the constant e-mails and cell phones mentioned to be very annoying, I hate cell phones and in a story that doesn't really need all that stuff, it seems out of place. Nim's Island is an easy to read story about an incredible girl who becomes the hero of her own story. I read this to my third graders. Really perfect for their age group. High vocabulary but not unreachable. Very engaging story with plenty of female heroes! A short but really fun and creative read. I wish I could live on this island, or at least have discovered this book when I was a kid. I listened to this book while my 11 year-old read it for a school book report. It was a cute little chapter book about Nim, who lives on an island with her dad, Jack. She writes to Alex Rover, a real-life author who lives far away, and sends pleas for help when her dad doesn’t come back. This book is delightful. My ten-year-old daughter and I read it together, and it led us to explore coral reefs, frigate birds, green sea turtles, seaweed and kelp, and seahorses, leafy sea dragons, weedy sea dragons, and pipefish (all members of the genus Hippocampus, which is the only genus where the male gives birth instead of the female.) It was a perfect book for a kiddo who is currently crazy about marine life. It is a clever, exciting adventure with a happy ending. 2018: This year my students all had their own book to read along with. I love sharing this fun story with them and listening to their theories! I read this with my kids for their summer book club. It is a very cute story. I listened to this audio book with you girls and we thoroughly enjoyed it. A great adventure story of an independent girl and her animal friends. Book much better than the movie! 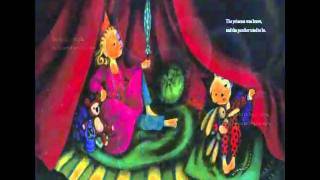 We loved this as a read-aloud book! I didn't enjoy this one as much as I did when I was a kid, but it's still pretty cute. I needed something short and light. This was a sweet, fantastical sort of story that I can see myself recommending to my little sister. Reagan (5) and I (over 30) read this together and really enjoyed it! As a frequent watcher of the show “Octonauts” we were particularly excited to have knowledge of sea iguanas! Looking forward to reading the rest of the series together! Also posted on my blog Got My Book. This is Book #1 of 3 in the Nim series. It is the only one available on audio. It could be argued that this book is not really fantasy, it is just a book about a very imaginative little girl who is good with animals. That's probably true; but it reads more like a fantasy than a straig Also posted on my blog Got My Book. It could be argued that this book is not really fantasy, it is just a book about a very imaginative little girl who is good with animals. That's probably true; but it reads more like a fantasy than a straightforward contemporary, so I feel comfortable reviewing it here on the blog. Although the book is very short, it feels longer (in a good way). And it is strong in all three areas I generally review (see below). Nim: Although she is very mature for her age, and able to take care of herself pretty well, she is also a typical child. She loves to have fun, such as playing coconut soccer with her "friends," and throws a bit of a tantrum when things aren't what she thought they were. The human supporting cast includes Jack (her father) & adventure writer Alex(andra) Rover. If I was reviewing this as a contemporary review, I might have to say some harsh things about Jack's parenting. But I'm not, so I can say that he is a loving & fun father who is raising a smart & self-sufficient daughter. / The animal friends are bursting with personality. Selkie, the sea-lion nanny, reminds me of Nana from Peter Pan. Although in real life I would probably hate the heat & humidity, this definitely makes me want to take a vacation to her island. There are so many details here of all the wonderful things in Nim's life. As well as a few not so wonderful ones, such as dead & rotting things - yuck. This is a really short book, and yet a lot of things happen. We get to start out with a more typical view of her life with regular chores & scientific chores plus fun with her animal friends. Then things start to get more & more serious as she loses contact with her father and complications ensue. The ending resolves all of these issues while leaving their future open to changes. --All the times they say they love something "the way..."
This is a very sweet story of a simple girl called Nim. 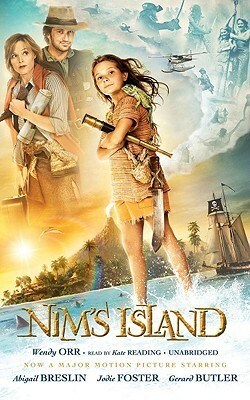 She and her father live on an uncharted island and Nim helps her father Jack with his science experiments and research. With Selkie and Fred tagging along for the fun. Orr has written this in such a beautiful way. There are no sweeping descriptions of the island and panoramic like explanations. They are detailed but short enough that do their job to create the perfect image. In addition, the narration from each characters point of view keeps This is a very sweet story of a simple girl called Nim. She and her father live on an uncharted island and Nim helps her father Jack with his science experiments and research. With Selkie and Fred tagging along for the fun. Orr has written this in such a beautiful way. There are no sweeping descriptions of the island and panoramic like explanations. They are detailed but short enough that do their job to create the perfect image. In addition, the narration from each characters point of view keeps you up to date with their present actions and gives insight into their personalities. Nim's narration captures the essence of a young girl, probably not yet a teenager given the way she is portrayed. She is a strong and independent girl, a product of living on the island with her father no doubt. She knows how to care for herself, manage on her own and help her father with his work. But we still get to see the child in her, especially her struggle as she tries to stay strong while she is alone on the island. The island's inhabitants are fun and friendly, perhaps a little too personified and human like than perhaps possible. But I suppose having grown up alongside these animals there is no way of knowing Nim's real relationship with the animals, she certainly can communicate with them, the rest may be a simple stretch into the possible. That was what Nim called it, because soccer was the only ball game she'd ever seen a picture of -- and because nobody else has ever thought of a name for a game with a girl, a sea lion, a turtle, and an iguana all trying to be the first to get a floating coconut to shore. Nim loved the ocean because it was always there, wherever she looked and as far as she could see, but it was too huge and powerful to understand and too dangerous to trust. Nim's father goes on a three-day boat trip to study plankton and doesn't return for two weeks. Nim is left to fend for herself with only an iguana (Fred), a sea lion (Selkie), and a green sea turtle (Chica) to keep her company. She does have email and makes an email friend in Alex, a famous author. Alex and Nim exchange emails, but they both make assumptions that end up being false. This is a cute story. Nim is a smart, resourceful, girl. I enjoyed reading how Nim interacted with her "friends" the iguana, sea lion, and sea turtle. I loved reading the exchanges between Nim and Alex and seeing how confused they both were about each other. We don't hear much about the Troppo Tourists, except that they were responsible for the loss of Nim's mother in an unusual way. And Nim and her father are desperate to keep the island hidden from them. Young readers who enjoy adventure. I picked this up mostly because I knew Wendy Orr lived in Australia, and I wanted to study some Australian voices. It turned out to be the kind of book I love: the kind that opens up a whole, vivid world inside your head, with relatively few words. I kind of feel about the island like I feel about Narnia, and I'm now actively avoiding the movie so as not to spoil that feeling. Nim's a wonderful heroine. Her favourite tool is a machete, her best friends are a sea lion and an iguana, and she's a c I picked this up mostly because I knew Wendy Orr lived in Australia, and I wanted to study some Australian voices. It turned out to be the kind of book I love: the kind that opens up a whole, vivid world inside your head, with relatively few words. I kind of feel about the island like I feel about Narnia, and I'm now actively avoiding the movie so as not to spoil that feeling. Nim's a wonderful heroine. Her favourite tool is a machete, her best friends are a sea lion and an iguana, and she's a charming mix of scrappy, sunburned adventurer and vulnerable kid -- without losing her little bits of selfishness to sentimentality. I have a 6 year old son. Every night, we read 3 stories to him. For the last several years, one of those stories has been a chapter out of a chapter book. So far, out of the chapter books we've read, this one is our favorite. It's exciting and adventurous, managing to keep the attention of both my kiddo AND me. Nim and her father, Jack, live alone on a beautiful, tropical island, but for the length of the book, Jack is stuck out at sea. The story is Nim's adventure on the island while Jack strug I have a 6 year old son. Every night, we read 3 stories to him. For the last several years, one of those stories has been a chapter out of a chapter book. So far, out of the chapter books we've read, this one is our favorite. It's exciting and adventurous, managing to keep the attention of both my kiddo AND me. Nim and her father, Jack, live alone on a beautiful, tropical island, but for the length of the book, Jack is stuck out at sea. The story is Nim's adventure on the island while Jack struggles to get home to her. Nim also strikes up an email conversation with an author from New York. Simple concept, yes, but it makes for a lovely story.